Acrylic paintings. 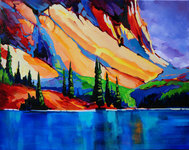 As a Port Moody artist I am inspired by the magnificence of the landscape that I live in. In my paintings I strive to capture the beauty of BC using warm,rich colors and bold brushstrokes to create light and energy.